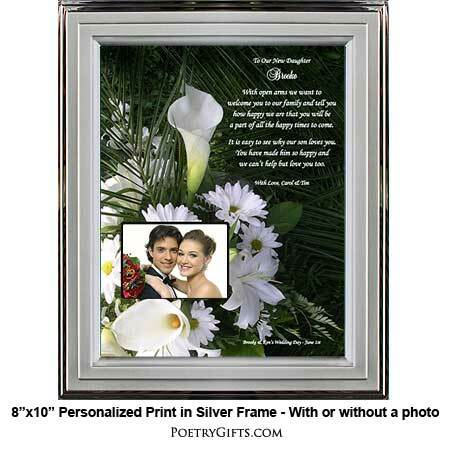 Honor your daughter-in-law on her wedding day with this floral personalized gift. This wedding keepsake can have an optional photo area to insert a photo either before the wedding or a wedding photo can be inserted after the wedding day. Perfect personalized gift from the mother-in-law, father-in-law or both in-laws to commemorate her and your son's special day. Wonderful "Welcome to the Family" gift for a daughter-in-law! Just think how touched she will be to receive such a meaningful and heartfelt wedding present from her mother and father-in-law. And your son will also appreciate your thoughtfulness. 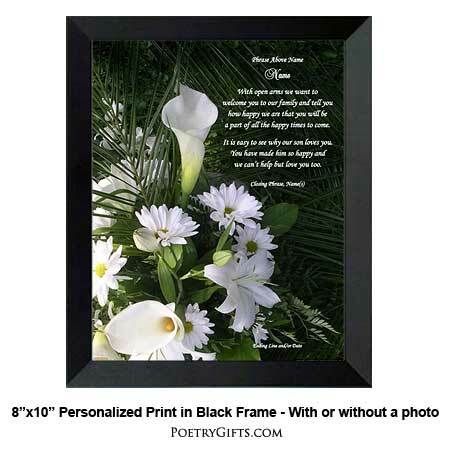 The personalized poem is presented on 8" x 10" quality heavy stock paper in a striking black design with white calla lilies and daisies. 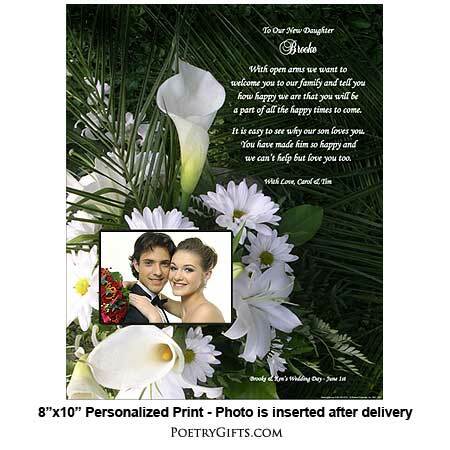 If you decide to add a picture of the bride and groom in the cut-out photo area it will really make this a one-of-a-kind wedding present for her. 1. Phrase Above Name (optional) - Examples: To My Daughter-In-Law On Her Wedding Day, To Our Wonderful Daughter-In-Law, Welcome to the Family, etc. 3. Closing Phrase and Your Name(s) (as seen after poem) - Examples: Best Wishes, Tom & Jan; With All Our Love, Mom & Dad Stephens; etc. a part of all the happy times to come. It is easy to see why my son loves you. I can't help but love you too. 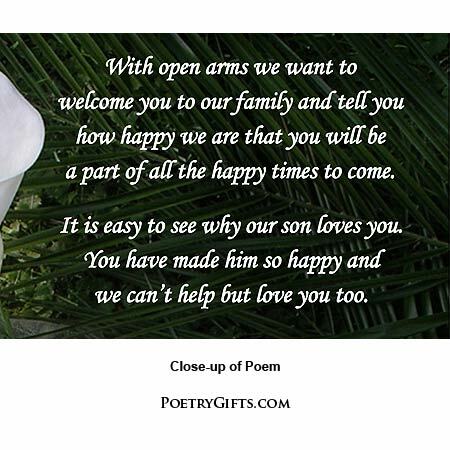 Your Poetry Gift can be designed with or without a cut-out opening for a photo next to the poem. A second sheet underneath the poem and photo cut-out is a heavy stock paper with the words "Place Photo Here." Answer questions above and "Add to Cart"
Excellent. Can't wait to give the gift to her at her shower this weekend. I couldn't be more pleased! Great job.